We will meet you half way with your puppy for a fee, depending on mileage and if we have to spend the night. We also have a pet nanny service that will fly your puppy to an airport near you, and a ground delivery nanny that will bring your puppy to your front door. 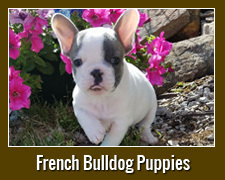 Go to our French & English puppy pages to see pictures of our available puppies! We currently have several puppies available on the puppy page! 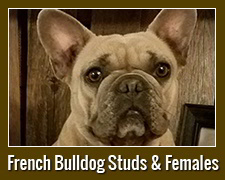 We have AKC Registered English and French Bulldog Puppies for sale in Oklahoma. We strive to produce puppies that meet and hopefully exceed the AKC standard in appearance & health with excellent pedigrees. 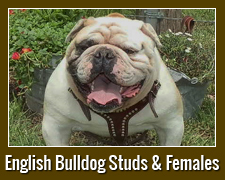 All of our English Bulldog puppies have champion bloodlines. My daughter Melissa and I both have small kennels at our homes with 10 females each. we live in the country in North East Oklahoma. 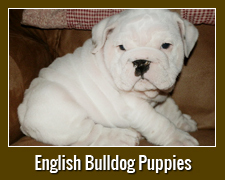 Breeding Bulldog puppies is a joy to us and we try to find the best homes possible for them. We welcome you to call or visit us any time. We have English Bulldog Puppies for sale year round, so if you don’t find just the right one for you this time, please visit us again. We keep our prices reasonable so anyone who loves this breed and has always wanted to own one of these loveable little guys can see that dream come true. Our puppies receive their first shots at 5 wks, 6 wks and again at 8 wks. They are wormed every 2 wks beginning at 2 wks of age. We will meet you half way with your puppy for a delivery fee depending on the mileage and if we have to stay overnight. . We encourage you to come and pick up your new puppy, if possible. Please call us at least 24 hours in advance to make an appointment. We will have all the documents ready for you to sign and take with you (Contract, Health Guarantee, Health Records… and some food for your puppy.) Or your puppy will be shipped or flown to you at 8 weeks of age. You can have your puppy flown in cabin with a pet nanny for $450 to $550, the airlines no longer fly snub nosed breeds (which include English and French bulldogs) in cargo. We can ship your puppy ground for $250 to most locations. Our puppies come with a one year health guarantee that covers all congenital defects. They also come with a certificate of health from a veterinarian. A deposit of $500.00 will hold your puppy, with the balance due before shipping, or in cash if you pick up your puppy. If you are paying through Pay Pal please ad 3% to the total to cover their charges. English Bulldog Puppies for sale in the United States: here are just a few of the Many States we ship to: We ship to Kansas, Texas, Missouri, California, Minnesota, Ohio, Oklahoma, Alabama, Arkansas, Colorado, Washington, North Dakota, South Dakota, Oregon, Nevada, Michigan, we fly to all of the United States.